During the Dharma Vanishing Era, this world will experience drastic changes. The weather will become unpredictable and epidemics will be widespread. To resolve the human health crisis, and promote the great mission of Human Health, World Peace and Religious Harmony, the compassionate Holy Master Ziguang Shang Shi reveals the One Day Zen and Triple Heart Zen, which are derived from the Guang Huan Mi Zong Great Perfection Esoteric Dharma, for those in need. To cope with the current conditions, the exalted Holy Master Ziguang Shang Shi will offer a series of training programs to Zen teachers and tonsured preachers, to improve their preaching ability. (1) Those who attended the first Zen Teacher Training Program this year and have guided at least 2 people to attend the classes at the Holy Mountain Buddha Land, can take the 5-day Triple Heart Zen Class for free. 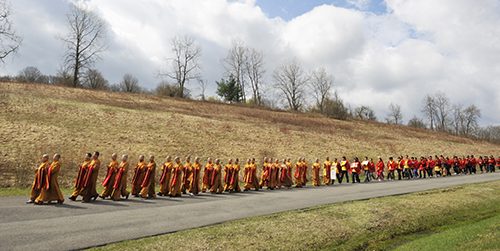 (2) Those who have guided at least 5 people to attend the classes at the Holy Mountain Buddha Land, can take this Special Training Program for free. (3) The new candidates of the Special Training Program, who attend this type of training program for the first time, must submit reference letters written by GHMZ centers and preacher/instructor/teacher, as well as an application letter written by himself/herself. Candidates cannot attend the program without approval. (4) The candidates of the Special Training Program, who have attended any preacher/instructor/teacher training programs in the past and would like to apply for this Program, should submit their application letters, and take their certificates with them. These candidates’ tuition will be discounted 50%. (5) To help candidates travel through the US customs smoothly and facilitate the process of making donations and paying tuition and/or fees, all monetary issues should be taken care of at the GHMZ Hong Kong Headquarters prior to entering the US. Representatives of each region can visit Hong Kong Headquarters, make their donations, pay fees, and receive their receipts. 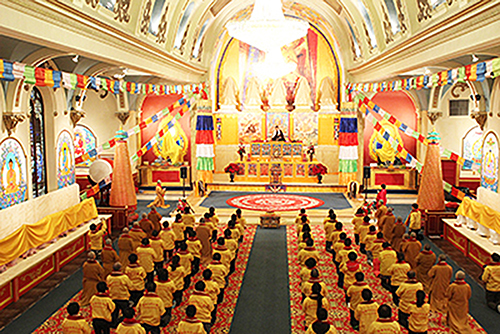 Candidates can proceed to then take the classes at Holy Mountain Buddha Land simply by providing their receipts. Candidates should make arrangements for their own lodging and meals at the Holy Mountain Buddha Land. (1) All tonsured preachers, monks and nuns are eligible to attend the program at no cost. (2) All candidates must submit their applications at least 10 days before the program. Candidates cannot attend the program without approval. (3) Candidates must have their sutras and certificates with them. (a) The families of all candidates must support them to attend the class/programs listed above. Candidates should not have obstacles upon learning Dharma. (c) Application deadline: 10 days before class/program begin. No applicant could attend the class/program without approval. (d) Registration address: Reception Center, Peace Hall of Holy Mountain Buddha Land. (e) The maximum number of packages of each person is two. (f) All students must dress neatly, be respectful and follow the rules and regulations, as the GHMZ Holy Mountain Buddha Land is where Arhans and Bodhisattvas assemble, and the Holy Land of Buddhist Dharma practitioners. (g) Students should take care of the lodging and meals by themselves.